A scholarly article based on the 'Jesus Wife' fragment was delayed as researchers waited on further testing. (CNN) - One of the most anticipated articles in religion circles will be absent from the pages of the January edition of the Harvard Theological Review. Harvard Divinity School professor Karen King's final article on the "Jesus wife" fragment did not make the scholarly journal because further testing on the Coptic papyrus fragment has not been finished. King announced the findings of the 1.5-by-3 inch, honey-colored fragment in September at the International Association for Coptic Studies conference in Rome. In a draft version of the article submitted for publication in the January edition, King and her co-author said the scrap had written in Coptic, a language used by Egyptian Christians, "Jesus said to them, 'My wife," but was then cut off. King said the fragment dates to the 4th century but could be a copy of an early gospel from the 2nd century. King and her research partners dubbed the hypothetical text "the Gospel of Jesus' Wife." Despite King's insistence, the discovery did not prove anything definitive on the marital status of Jesus. The announcement of the papyrus scrap exploded in the media. "The earliest reliable historical tradition is completely silent on that. So we're in the same position we were before it was found. We don't know if [Jesus] was married or not," King told reporters in a conference call from Rome in September. A dealer took the fragment to King for analysis and translation in 2011. The dealer wishes to remain anonymous, she said. "We're moving ahead with the testing, but it is not yet complete, and so the article will await until we have the results," King said in an email to CNN. "The owner of the fragment has been making arrangements for further testing and analysis of the fragment, including testing by independent laboratories with the resources and specific expertise necessary to produce and interpret reliable results. This testing is still underway," Kathyrn Dodgson, director of communications for the Harvard Divinity School, said in a email to CNN. "Harvard Theological Review is planning to publish Professor King’s paper after conclusion of all the testing so that the results may be incorporated," Dodgson said. "Until testing is complete, there is nothing more to say at this point." In her original article King explained how a papyrus expert had dated the fragment to the right time frame and how an expert on Coptic linguistics said the grammar seemed to fit the time period, as well. But what was untested in the early goings was the ink used on the papyrus. 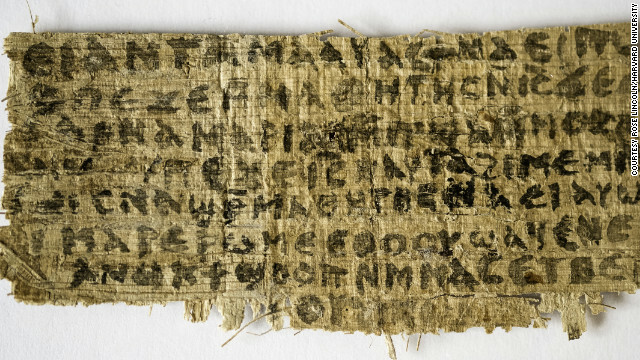 Elaine Pagels, a professor from Princeton University who is an expert on gnostic writings such as this one, noted to CNN in September "You can find boxes filled with Coptic fragments," but what makes this one significant is for the first time it explicitly has Jesus referring to "my wife." Faking antiquities is not uncommon, which is part of the reason so many critics questioned the authenticity of a text that potentially went against nearly every other ancient text concerning Jesus. Other scholars refused to comment on the find until the full battery of testing could be completed. “The academic community has been badly burned,” Douglas A. Campbell, an associate professor of New Testament at Duke Divinity School said in September, noting how similar discoveries have turned out to be fakes. The provenance of the document, "the history of where it came from and how they got it,” was a great concern to Campbell and other academics. On the day King announced the fragment, the Smithsonian channel announced it had been working with King for months on a documentary about the find and the authentication process. It had been slated to air in early October but was pulled back. Tom Hayden, general manager of the Smithsonian channel, said in a statement in October the delay "will enable us to present a richer and more complete story. We will be announcing a new premiere date in the coming weeks." No announcement has been made as to when the premier will happen. At one time in my life I worked hard to be good enough to enter heaven; just like any good Muslim, Hindu, Buddhist or even Christian. I was always so frustrated when I failed in achieving self righteousness. Then I realized that I was flawed. My carnal mind would frequently lead me astray. I could never achieve righteousness on my own efforts. I certainly was also guilty of past sin. I could never stand before a holy God in judgment. Then I realized that Jesus Christ already achieved the righteousness that I was working so hard towards. Jesus Christ did it all for me. I was freed from my carnal limitations. I am holy in Christ. I can stand before God in judgment and have Jesus Christ plead my case for me. Thank you Jesus. If Jesus had a wife it would have no impact on my faith what so ever. Jesus's work on the cross remains true. Hope you enjoy no god(s) required. Are you the generated ghost this new device has created ? Feb. 19, 2013 — A team at the NUS Department of Electrical & Computer Engineering led by Dr Qiu Cheng-Wei has come out with an optical device to "engineer" ghosts. The END IS NEAR !!! Feb. 13, 2013 — The greatest battle in Earth's history has been going on for hundreds of millions of years – it isn't over yet – and until now no one knew it existed, scientists reported Feb. 13 in the journal Nature. "I'M CHRISTIAN TOO" Why Oprah, Eckhart Tolle, Marianne Williamson, Joel Osteen, Deepak Chopra, AND All New Age Spiritual Leaders and Gurus Need To be Questioned About Their P.L.A.N.S to Mislead Christians"
Christ was speaking about spirituality. His movement was called 'Belong to the Way' similar to the Taoism (know the way of supreme reason) and Hindu Yoga (union with the System). Christ's movement attacted a lot of followers from Judaism. Paul was sent to suppress the Way people, and he got converted to this intellectual movement as it preaches the relationship between the self and the World that supports life which he called 'The kingdom of God'. There is no need of any speculation here. Great benefits would be done to mankind if Christianity returns to the teachings of Christ. The only historical record of his teaching was discovered in Egypt in 1945, this fragment is part of that finding. Gospel of Thomas speaks about the relationship of the soul that people lose under the influence of religions that give importance to externals. Christ must have got training in this from the Brahmins who lived in Swat Valley- now it is in Pakistan. From 13 to 33 he must have been there. Malala who was shot recently by the Taliban is from Swat Valley. Christ's contemporary Apollonius of Tyana (AD 15-100), a popular contemporary of Christ, travelled to meet Indian Brahmins in search of knowledge. Tyana refers to Anatolia (Asia Minor), the Asian part of Turkey. Apollonius travelled to met the Brahmins in Swat Valley of the present Pakistan. Here is the account of Apollonius meeting them recorded by historian Philostratus (Greece, BCE ~170- 250). A member of the community is reported thus: "We know everything, just because we begin by knowing ourselves; for no one of us would be admitted to this philosophy unless he first knew himself." ‘Know the self’ means regaining the sensibility of the soul that we get with life for our moral guidance. It has two implications. All religions should give importance to 'Know Thyself' for bringing sanity into life. Now they preach knowldge of external things. Consequently people have lost their souls. Soul can be replaced or repaired on bottom of shoe. "We should never identify ourselves with reason, for man is not and never will be a creature of reason alone, a fact to be noted by all pedantic culture-mongers." If this is correct, then Jesus' teachings were not far from those of Maimonides 1,000 years later, and having almost nothing to do with present-day Christianity. It seems to me that if Jesus had a "wife", she would of been mentioned and by name on crucifixion day. Jesus loved many. Not to say, women of the day would not have married Jesus. Perhaps, many would have. But because Jesus loved, he also knew, that he was going to be crucified, so in better judgement he may not have actually "married", and had children to leave behind. We know Jesus was 33 years old when he was crucified. He was a carpenter. He was a great physician. When asked about marriage, Jesus said it's better to be as I am, but if you lust or burn, it's better to marry. Jesus had many things to worry about, and regarding his impending crucifixion, his prayer was, not my will, but thine be done, when talking to God, up in heaven. Jesus also knew, that he was heaven ward bound. On the third day, he was caught up into the clouds. To dwell there forever. But he also said, I go there to prepare a place for you, if it were not so, I would of told you. The present Christ is the fabrication of the Church. The Emperor who cam after Constantine made Christianity the religion of the Empire. Before that Cristianity existed with many other forms of worship, among them was the Zoroastrian god Mithras born on Dec'25th and resurrected on the 3rd day. It was during Constantine who blended Christianity with Mithras worship. Thus Christ disappeared behind Mithras. Christ was demanding spirituality, and for that he was preaching the relationship of the self with the World of Life that he called 'Kingdom of God'. This really is spirituality. See my post above. Yes people do care. People with hearts thatcan feel for another person. Even for a person from another religion becuse real people do care. People who belive in christ experience christ in mabny many way's even if your experinece in life in not a happy one. Think hard before it's too late. Think!! Learn how to think. How open up your mind. "...we have a viable theory of the universe back to about 10-30 seconds. At that time, the currently observable universe was smaller than the smallest dot on your TV screen, and less time had passed than it takes for light to cross that dot." The bible is either the inerrant word of a god, or it is open to interpretation. If open to interpretation then any interpretation is as good or bad as another, and therefore cannot be the basis of any spiritual "Truth". If Christians had any honesty about them, they would commit to the life of a literal bible. Otherwise they're just practicing a farce of cherry-picked, appropriate for the moment, feel-good, reinterpreted, smiley-face platitudes. This is my experience... Thank you. I Accepted Jesus christ as my lord and saviour. You never know how soon is too late. Transcend the worldly illusion of enslavement. Accepting Jesus Christ (for me) resulted in something like seeng a new colour. You will see it .....but will not be able to clearly explain it to anyone else..... Its meant to be that way to transend any selfism within you. Also... much the world arranges "surrounding dark matter into something to be debated" in such a way that protects/inflates the ego. The key is be present and transcend our own desire to physically see evidence. We don't know anyways by defending our own perception of dark matter. Currently.... most of us are constructing our own path that suits our sin lifestyle. Were all sinners. Knowing that we are is often an issue. But both christians and non are sinners. Even once we are saved by christs merciful grace we will still experience adversity to mold us to adhering to the truth. We will slip... But not fall of the ship ...carrying us onward to perfection in christs grace. We don't like to Let go and let god. We want control to some degree. This is what Jesus asks us to do. "Follow me". It's the hardest thing to do... but is done by letting the truth of scripture lead you (redemptive revelation)... as I said . Try reading corinthians and see if it makes sense to you. Try it without a pre conceived notion of it being a fairy tale. do we do what it says in todays society... is it relevant... so many have not recently read and only hinge their philosophy on what they have heard from some other person...which may have been full of arogance pride or vanity..
Look closely at the economy ponzi, look at how society idolizes Lust , greed , envy, sloth, pride of life, desire for knowledge, desire for power, desire for revencge,gluttony with food etc . Just think if you can find any truth you can take with you ....in any of these things. When you die your riches go to someone who will spend away your life..... You will be forgotten.... history will repeat iteslf.... the greatest minds knowledge fade or are eventually plagerzed..... your good deeds will be forgotten and only give you a fleeting temporary reward . your learned teachings are forgotten or mutated..... your gold is transfered back to the rullers that rule you through deception. Your grave will grow over . This is truth . Trancsend your egoism and free yourself from this dominion of satan. Understand you are a sinner and part of the collective problem of this worldly matrix... Repent.... Repent means knowing (to change) The Holy spirit (within) will convict you beyond what you think you can do by yourself. Grace is given to those who renounce the world. That are" in" the world but not "of " the world. Evidence follows faith. Faith does not follow evidence..... Faith ....above reason in Jesus Christ. Read Ecclesiastes. Read romans or corinthians. You cant trancend your own egoism by adapting a world philosophy to suit your needs. Seek the truth in Christ. Sell all your cleverness and purchase true bewilderment. You don't get what you want ....you get what you are by faith above reason in christ. I promise this has been the truth for me. In Jesus christ . Think of what you really have to lose. ...your ego? Break the Matrix of illusion that holds your senses captive. once you do . you too will have the wisdom of God that comes only through the Holy Spirit. Saved By grace through Faith. Just like seeing a new colour.... can't explain it to a transient caught in the matrix of worldly deception. You're all smart people . I tell the truth. Its hard to think out of the box when earthly thinking is the box. Old hammers, worn with beating years of time. The anvil is unharmed – the hammers gone. The fact you post the same type of crap over and over again is proof you have an ego problem! I wonder if she gave good head? If the pope dies alone in a forest, does anyone care? No. Millions of Catholic respect and love and the holy father. They anwer to your questions is yes, many someones would care.